On the evening of September 27, 2008, right at sunset at approximately 7:00pm, Martin Maxwell crashed his powered paraglider trike in Monument Valley Park, Arizona. Here is my account of this incident that is being submitted to the Sheriff’s Office and that I am posting publicly with the pilot communities. As for my credentials, I am a experienced powered paraglider pilot and flight instructor, tow operator, and paraglider pilot. I had worked with Martin to teach him to fly a powered paraglider in the Fall/Summer of 2008. I also considered him a friend. We both separately decided to join an informal gathering of pilots to fly that weekend. Also, the following day after the incident, I volunteered to go to the crash site to help understand the reasons for the crash and to recover the gear. In knowing Martin his friend and flight instructor, I know that he spent a great deal of effort and time studying pilot incident reports, trying to learn from the experiences of others. I believe this incident report I have prepared is something he would have wanted me to do. And so in writing this, I believe I honor his memory. Also, considering he was my friend, writing this report has been particularly difficult for me. It is my hope that preparing this incident report will prevent future incidents and fatalities. Pilot ExperienceMartin was a very experienced recreational, licensed hot air balloon pilot, with over 23 years experience and many flights as pilot in command and as a crew. A number of years previously, he had also tried to obtain his General Aviation private license and came very close to completion. He was also actively involved in CAP (Civil Air Patrol) and flew regularly in small fixed wing aircraft on search and rescue operations. He loved to be around anything flying related. With powered paragliding he initially worked with me showing his talents as a professional videographer to create a video called “Introduction to Paramotoring” which can be seen here: http://www.youtube.com/watch?v=_oSZSiVev0I When it came to his powered paraglider trike training, he completed this over several months in the Fall/Summer of 2008. He purchased a MacPara Eden II 33 paraglider, a Fly Products Gold 115 motor unit and a Fly Products Flash trike. Considering he weighed 235 pounds, this gear was ideally sized for his weight. I made sure his gear was set up and running as best as possible. He completed his solo flight on August 1, 2008. He exhibited a great deal of skill in launching, flying and landing, but by all measures was still beginner a powered paraglider pilot. Yet on several occasions myself and other local pilots felt that he was trying things too advanced for his limited powered paragliding experience. This was conveyed to him several times by me that it would be wise to progress slowly, safely and over time. He seemed to listen carefully and respectfully but clearly he disregarded these recommendations. His flight at Monument Valley was number 15 as pilot in command in his powered paraglider trike. Pre-Incident BackgroundA number of powered paraglider pilots (roughly 30) had informally gathered that weekend to fly near Monument Valley. Our staging area was Gouldings Airport, about 5 miles from Monument Valley Park. Martin had told a number of people he would be coming and indicated that he had dreamed his entire life to fly at Monument Valley. He arrived late Friday night with his wife Lynn and older teenage son Preston and 3 dogs. He set up camp at the Gouldings Campsite. He did fly twice early on Saturday morning and reported the conditions were bumpy. Last Flight TakeoffOn Saturday afternoon, a number of powered paraglider pilots informally met at Gouldings Airport to hopefully fly in smooth, late day air. We arrived around 4:00pm to find the wind gusting from the West. No one launched. There were a number of larger cumulus clouds developing 15 to 20 miles to the South and East and also to the North and West. Around 5:30pm conditions had calmed considerably at the airport. I was one of the first to launch to feel it out. The air was quite smooth, with minor bumps, and other pilots then started launching. Within a short time, the large clouds to the East and South had begun to grow and develop into formidable cumulus clouds and occasional lightning could be seen coming from them. Most pilots opted to stay close to the airport due to the warnings of the ominous growing clouds in the distance. The few that did venture out were mostly experienced pilots and they came back to the airport and landed even though the air was still quite smooth. It appears that Martin launched sometime between 6:00pm and 6:30pm and headed West by himself directly to Monument Valley Park, specifically towards Mitten Monument, which was over 5 miles away from the airport. He was also heading directly to the growing, ominous thunderstorms which were growing towards Monument Valley. By this time, most pilots had come in to land or were preparing to land. By approximately 6:45pm only two other pilots were still flying when the air at Gouldings Airport became very rowdy. The two remaining pilots were being tossed up and down, yet both landed without incident. The two thunderstorms to the West and South West appeared to converge and blowing dust and lightning could be seen around them in the distance. Most pilots packed their gear and headed for Gouldings Restaurant after sunset for an informal gathering. Martin’s wife commented that her husband was missing. She had not seen him launch and inquired if anyone had seen him. No one had any recollection of him even launching. Later one pilot revealed he had helped him launch on the end of the runway. The CrashPreston, Martin’s son, and Chad, a friend Martin had invited, were staged on a dirt road about 0.75 mile from Mittens Monument and were taking some photos of Martin flying around the monuments. Perhaps Martin became fixed on making those photos a reality. Right before sunset, at approximately 7:00pm, several eyewitnesses at Monument Valley Park, including Preston and people camping at the Park noticed Martin was flying towards and within 0.5 mile of Mitten Monument at 200 to 300 feet above ground when his craft began to get rocked violently in large up and down swings of 50 feet. The thunder storms had developed considerably and were now within a few miles of Martin probably throwing him some very strange air. The witnesses were approximately 0.25 to 0.33 mile away. 2 witnesses noted that his motor sounded to be running erratically up and down, but it was probably that the pilot was simply adding and reducing throttle to try to stabilize his violent ups and and downs in altitude. What happens next is uncertain whether he lost altitude from the severe weather (strong winds, downdrafts, gusts and/or rotors) that was moving on him, that he became scared and wanted to land quickly and reduced his throttle accordingly, or his motor began to “sputter” (the exact words of 2 witnesses) and he simply could not maintain his altitude. His son noted that he got a minor wing tip collapse and then turned around, heading back to Gouldings Airport. The severe rocking and loss of altitude began to quickly increase. As he lowered in altitude he began to descend into very unforgiving, hilly, canyon-like terrain. Preston noted the rocking continued to increase very violently as he descended and his motor was revving up and down. This was probably due to the strong rotors he was getting off the nearby hilly terrain. At about 50 feet above ground and well below the horizon of the canyon-like terrain, Preston noted he had a very severe full wing collapse and then he crashed with his motor running at full throttle into the side of a hill approximately 0.25 mile away from witnesses. Witnesses reported a large cloud of dust shot up and then the motor quickly became silent. 911 calls were made at just after 7:00pm. Preston and Chad rushed to the scene of the crash. Preston estimates he was there within a few minutes as he ran as quickly as possible to help his dad. When he arrived he found Martin in the wreckage unconscious, not breathing, and with what appeared to him as a very faint heartbeat. It was clear he had landed extremely hard as his gear sustained substantial damage. Considering the remoteness of the crash site, the difficult terrain, the crazy weather approaching, and that dusk and night was coming on quickly, rescue and recovery efforts were slow. It took rescue crew an additional 50 minutes to find the crash site in the pitch of night and difficult terrain. Martin was pronounced dead on the scene. Cause of Incident and DeathThe initial autopsy report reveals that the cause of death was “multiple blunt force injuries” mainly to his chest cavity. With any aviation related accident, there usually isn’t one cause that can be labeled as the only cause. It is usually a string of multiple actions and choices. This incident has a number of contributing factors, all stemming from poor decisions of the pilot. First, was the weather. The warnings were all around calling out loudly and clearly. As an experienced, licensed hot air balloon pilot and with his powered paraglider training he was intimately aware of reading these warnings and fully aware of the risks of flying in unforgiving weather. It is not clear why he chose to ignore these warnings given his extensive experience in reading weather. Second, was the terrain he was flying over and landed in. It was extremely unforgiving, jagged, hilly, and dangerous. Given his paramotor training, he was fully aware of the severe risks associated with flying over and landing in rough terrain. Third was his experience level. He was flying over terrain and in weather that was well beyond his experience level of 15 powered paraglider flights. Fourth was getting caught up and hyper focused into a task or series of tasks (such as flying around the Monuments, being the center of some special photographs, showing off for family and friends). The Next DayEarly Sunday morning myself and Craig Squillante, a fellow experienced powered paraglider pilot joined the investigating officials to the crash site to try to piece together what happened and later carry out the gear. We found the point of impact and carefully examined the crash scene looking for details to unravel this puzzle of this incident. It was clear that the landing was very hard as the trike and motor cage was severely bent up and broken. He had considerable downward and forward forces on impacting the side of a steep hill. The propeller was cleanly shredded to about 16″ long, with hundreds of propeller splinters scattered in a 30′ radius. This indicated that the landing was at full throttle. Additionally, the force of the impact coupled with the gyroscopic forces of the shattering propeller at full throttle ejected the entire motor frame (motor, prop, fuel tank, carburetor, etc) approximately 8′ away from the trike and cage. Final ThoughtsThis incident was caused by a cascade of pilot errors that all compounded onto each other. There was some question that perhaps his motor failed him, but these reports came from unreliable laymen witnesses who heard the motor from approximately 0.5 mile away. Additionally, there was conflicting reports from the eyewitnesses on how his motor sounded. I believe his equipment operated normally as there was no other indications to the contrary and previously it had operated flawlessly. There was a lingering question whether a helmet may have helped to prevent his death. The autopsy indicates that a helmet would probably not have saved his life, even though Martin chose to fly without one with full awareness of the added risks. Some pilots questioned whether a reserve parachute may have helped. I do not think so. Considering the terrain and the severe weather and his lack of experience, a reserve deployment would probably have made matters worse. If there is a major lesson to be learned it is first and foremost to fly within your experience level and push your skill levels slowly. Second, to stay cautious and respectful at all times on the weather and the terrain below you. Third, to recognize that flying is a continual process of learning, respect for mother nature, respect for the limits of your gear, and respect of your own limits. So I am going to shorten this all up for you going from the Head to the feet: The brain plates in the head= The one in the back split from the rest and crushed the brain which would not have killed right away but if not attended to it would have. He broke the connection between his neck and his spine in bone. He broke his left shoulder. Many internal injuries including cracked ribs 5 and 6 on both sides, he popped his aorta making it bleed profusely. He popped the right pulmonary artery another artery that would bleed profusely. And the Inferior Vena Cava, another profuse bleeder. He had 640 ML of blood in his chest cavity. He punctured his lung when his ribs popped and made that bleed but there was a very small amount there, not enough to kill. He popped his pubic bone from his pelvis, so he broke his pelvis in turn. And if anything could get any worse, he broke his left femur. The big bone in your leg. This was no soft run into the ground. For any one who was wondering- He weighed 242lbs and was 73 inches in height. He was stiff and not easy to move as stated by the examiner. The injuries Martin sustained were certainly much worse than I had anticipated. I will concur, especially from how damaged I saw his gear, that he hit very, very hard. In my discussions with you, the other eye-witnesses, and from studying the wreckage, I estimate with a high probability that he was flying downwind and with a very fast downward velocity when he impacted the side of the hill. I also estimate he encountered some very severe air turbulence in the form of rotors seconds before he impacted. I met Martin at the airstrip about 45 minutes before his fatal flight. While we were hanging at the airstrip waiting for the weather to change I noticed an unfamiliar face and introduced myself to Martin. We chatted a bit about ballooning And he told me a story about where he had waited at a balloon festival with “hundreds” of pilots for the weather to cooperate. Martin and I had corresponded extensively prior to the Fly-in, mostly concerning camping options and how much cheaper it was to stay on the reservation. He also contacted me to suggest ways to improve the event. I was peeved that he didn’t want to spend the 25 bucks to stay at Gouldings with the rest of us, but it was an informal Fly-in, if he wanted to stay at the Dry camp in the reservation, that was his business. After his death I re-read our correspondence and came to realize that he wasn’t so much trying to tell me what to do…but rather he was just very excited about flying the Monuments and I was the guy putting it on. How are we gonna find this guy in the middle of nowhere, in the dark. I forgot about the missing car keys and rushed up to the Lodge with Mark L.to get the scoop. The first person I spoke with was Barbara, the restaurant manager, who informed us who the pilot was, she said, that he had been located and EMT’s were en route. That was good news, I figured that he had broken his leg or something minor and at the worst it was going to be a whooping big fee for the evacuation. The Banquet was anything but a celebration. Everyone was very subdued and in no mood for a rowdy good time. My “Master of Ceremonies” speech was short, stilted and totally unacceptable. I wanted to thank John Fetz for all of his help and recognise the famous pilots among us and have everybody stand and introduce themselves. None of that happened. I think I said something inane about this being the “Holy Grail” and looking forward to seeing everybody again next year. After dinner I went with Mark back to the airstrip to retrieve my truck and 30 minutes later when I got to the campground, Ky rushed over and said, ” The Guy…He Dead. I couldn’t believe it, then he repeated “He Dead… Man” and I thought I was going to be sick. How could this happen? Everything was going so well. It was hard to accept, nobody saw an accident. There were no sirens or flashing lights, everybody I had been partying with was still here. From all appearances everything was just as it should be. How could somebody be dead? Chris Page and Andy MCavin were sitting at a picnic table with several pilots talking about the conditions and what might have happened to bring Martin down. I sat and listened for awhile but it was hard to sit still. I wandered from group to group not saying much, just making an appearance and gauging their emotions. The Colorado Springs guys were very quiet. At Alex’s trailer I found Ky with Alex reviewing the footage of Alex tangling with the rotor. Lon only got part of it, one bounce up and then seeing him land on the downstroke, just enough to show the severity of the turbulence. I know Alex was thinking…”That could have just as easily been me”. Mathew and Kevin were just sitting quietly and when I asked if they were planning to fly in the morning, Kevin who is by far the most experienced aviator said, “No, when somebody dies that’s it, I won’t be flying tomorrow. Martin had been Mo’s student, he was feeling a mixture of guilt, confusion, anger…but most of all sadness because he had come to know Martin and his family well during the last year. He had been down to the crash site and met with the Navajo Tribal Police, they were going to go to the crash site the next day to clean up and try to ascertain what had happened. I appreciate that he made a point of telling me that I was not to blame ….Martin was the “Pilot in Command”. Later after I had gone to bed, Craig came in after spending time with Martin’s wife and son. He had a memory stick of photographs that one of the spectators had taken. There was some discussion of what to do with the pictures. Craig though we should erase the stick before Martin’s son could ask for them. He was was worried that the photos would do more damage than good and we agreed. But…if there were pictures and possibly video of the incident, it would be valuable data that might prevent someone else from making the same mistake. Eventually curiosity won out and I booted up the laptop and we opened the files. The pictures were a bunch of nice shots of Martin Flying but there were no indications of turbulence or shots of the accident. There were some other files with pictures of the accident site but none of us needed or wanted to see Martin’s broken body. The police had copies and that was enough. The wind blew consistently all afternoon and we could see some serious weather building in the west. In the words of one pilot, “I think we are going to be snookered this afternoon”. But… Your not fishing unless your bait is in the water, and so at 4:45 the whole lot of us went down to the airstrip. The wind was 10 to 15 from the south and you could see by watching the flag at the top of the mesa that it was blowing much stronger aloft. Chris broke out the toys and was entertaining us by buzzing around the airfield on his scooter and shooting off a potato cannon. John Fetz was holding court on a tailgate and the hanger stories were getting older and hairier by the minute. I drifted from one group to another enjoying the moment and watching the skies. As the sun got lower the wind started to abate, we were watching a fairly large cumulus building to the east, a couple of miles past the entrance to Monument Valley and although it was building, it was down wind and moving away from us. At 5:30 or a quarter to 6 the flag on the top of the mesa started to slow way down and soon after, Mo launched in almost no wind conditions. We watched him do a couple of laps around the LZ and there was no question that the air was flyable. Everybody started laying out their wings, Johnny Fetz set up to launch to the south using the runway. He is still trying to “dial in” the buggy, (it can be configured to use either a Delta Wing, Paraglider, or Land Sail), and the thrust line was playing hell with his wing so he never got off the ground. I watched several guys launch including an exciting takeoff by one trike pilot who followed his wing around until he was pointed directly at a beautiful little Citation. He managed to pop it up before it got too hairy, but I was holding my breath the whole time. No harm no done and from the look on his face I could tell the lesson was learned. A few minutes later the wind was a 4 to 5 mph from the South East so I laid out in that direction and took off. It wasn’t glassy but it wasn’t bad either. I went a mile or so East of the LZ and played around keeping an eye to Monument Valley where the skies were grey all the way to the horizon. After about 45 minutes I came back and started my approach at the far north end of the runway. It was probably the best landing I have ever had, I was 5 feet up when I crossed the end of the runway and with just the slightest brake pressure I managed to stay at that height or lower all the way to the helicopter pads, at least half a mile. Since the runway slopes up from the north I was climbing just slightly the whole way. When I touched down I kept the wing up and taxied to the apron turned off the runway and collapsed the wing. Man, it felt good! Lon was filming and I really looked forward to reviewing my little triumph on video. Just a minute or two after I landed I watched Alex come in from the North East, He was obviously in some pretty rowdy air and I saw him being swung from side to side. At 50 feet he was hit by a rotor and bounced up at least 50 feet and just as fast as he went up I watched him come down then back up again. He managed to land on his feet during the next downstroke narrowly missing the fence at the end of the apron. I spoke with him later that evening, he said that was the most active piloting he has ever done and the most scared he has ever been in the air and I believe it. In all the DVDs and hundreds of times to the field I have never seen rotor bounce anybody so dramatically. I thought he was going to come down hard and at the very least break legs and wreak his equipment. It is a little over 2 minutes but worth seeing. At 30 seconds listen and you will hear Mo Sheldon commenting on the weather and urging people to secure their wings. Followed by Alex getting caught in the gust front. Shortly after that, Chris Page played it smart and came in at the far North end of the runway. Wow ! It was amazing how fast everything went to hell. One minute I’m patting myself on the back for a sweet landing and the next minute guys are dropping out of the sky in emergency landings. Thirty minutes later everybody had packed and left for the Banquet, I had lost my keys somewhere and was wandering around the runway apron looking for them when Bill Rowe drove up and told me that we had a pilot down and he had received a text asking for medical attention. Most of us were at the field by 6:30am. The sky was showing first light and the Monuments were coming into focus in the east. At 7:15 the winds were light on the surface and my launch was clean in every respect. This was the best flight of the trip. The winds aloft were between 10 and 15 mph and I encountered both lift and sinking air that was rather dramatic, I was glad that I had decided early to get high because it was definitely the right place to be. Heading north east I flew toward Eagle Rock and circled around it to Brighams Tomb and Bear and Rabbit Summit. I was level with the buttes and was starting to feel the bumps from mile away, so… I added some thrust and climbed 300 feet higher where it smoothed out. I wanted to take a picture of my shadow against the face of one of the buttes but it meant going down into turbulent air to be low enough for the sun so I made do with shots from above. In the picture below you can see my reflection which is the bright spot above the butte. The ride was smooth and fast, when I realized that I was heading back at close to 40 mph I wished that I had used the extra gas to go all the way around the Big Indian. When I got back over the LZ there was still plenty of fuel So I stayed high just boating around and doing circles, watching the wings below me and generally enjoying the view. The surface winds were from the south and swinging around the southern Mesa at Gouldings so I decided to land at the northwest end of the apron to avoid the worst of the twitchy currents. Jon Zucala and Jim King were setting up and watching me come in. At 200 feet I caught the headwind and my glide got allot steeper… FAST. I modulated the throttle to smooth out the glide. At 50 feet I hit a bump and instantly dropped another 20 feet. Talking to the guys later, it looked alot worse from the ground. But the bump was over before I could do much so I just took it for what it was and stayed on short final as planned. The landing was nice, almost no forward speed and touchdown was light as a feather. Jon asked me, “How did you do that?”, I wasn’t sure what he meant but later I figured out that he was just paying me a compliment for the nice landing. During the next 45 minutes most of the guys landed and at 9:30, right on the button, the first of the commercial tourist aircraft began to land. Jeff and Phil were the last guys down, they quietly packed their equipment and left before I had a chance to chat with them. I wanted to know where they went but from the amount time they were in the air, I’m sure they covered allot of ground. I expect that I’ll see their footage on the next Light Touch DVD soon. A couple of the commercial pilots came over and were asking questions about our sport. One of them seemed very interested and I think that, had he been alone, he would have stayed longer and hooked up with an instructor. We were teasing him about coming over to the “dark side” and from the look in his eye I wouldn’t be surprised to see him at a fly-in someday. It had all the makings of an Epic Fly-In. There was a great group of pilots (27) including several who are considered elite. There were three experienced filmmakers, who combined, had produced the best of PPG videos available. The campground was complete with all the necessities including restaurant and swimming pool. The weather was decent and the terrain was awesome. It was a quick drive to Monument Valley, eight hours, no stops except for gas. I was torn because I knew that Marek, Robert and Bryan would be flying Moab on Thursday but I wanted to get to the campground and make sure everything was ready before anyone else showed up. My campsite was beautiful, it was on the top level of the campground looking through the walls of the canyon at “Boy Scout Butte”. I cooked a couple of Brats and went to bed early. Thursday morning I was at the airstrip by 6:30am. The wind was blowing from the south at 10 -12 mph and gusty. Not a good thing… I hoped this wasn’t a sample of what we were going to see for the next three days. After two hours of para-waiting, I decided to bag it and scout around a little bit. I stopped at the campground office and gave Yvonne a bunch of waivers for any pilots who didn’t bring one signed and ready to go. We discussed the campground layout and tried to work it out so that everybody would be in the same area. Then I went to the Restaurant and met with Barbara to make sure they were ready for the Banquet planned for Saturday night. It was all good. My next stop was at the Navajo Tribal Park Headquarters, I’d tried several times to contact ,”The Nation”, but they were surprisingly elusive, rarely answering the phone and never returning calls. Some of the pilots wanted to stay at the Dry camp and I thought it might be a good idea to check it out. I paid my $5 to get in and asked who I should talk to about getting permission to launch inside the park. I was directed to a fellow who informed me that the $5 entry fee wasn’t going to “cut it”. He said that Hot Air Balloons paid several hundred dollars a day and motorized aircraft paid even more. I explained that we were not commercial pilots and didn’t have that kind of money but his response was …”Well that $5 entry fee just isn’t going to cut it”. When I asked him if $10 would be enough he just shook his head and said $5 wasn’t going to be enough. When I asked how much would be …I got the same response…the $5 entry fee wasn’t going to cut it. Since he wouldn’t tell me how much it would “cut it”, I figured that there was no clear policy and I was being fished for whatever we could pay. So… I thanked him for his time, promised to tell the guys and left. Since I’d paid my entry fee for the day I decided to check out the visitor center. In a few years it’s going to be magnificent, “The Nation” is building a large motel with all the facilities but right now its just a very expensive gift shop and snack bar overlooking the valley. When I got back to Gouldings, pilots were setting up their camps and watching the skies. The wind was still blowing but I was hopeful that it would come down as the sun set. At 5pm we went down to the airstrip and I got in my first flight of the trip. The winds were light and coming from the west. It was a little like the evening flight I’d had in August but not as windy. On that flight I took off, did a 360 and landed. The winds were twitchy with different currents pulling me all over the place. This time I could still feel the air was confused but it was much milder. I circled the field in a half mile circle and did a couple of touch and goes. The air was bumpy but not terrible. The Mapsource profile shows clearly that I was getting bounced around a bit. It was flyable but it wasn’t great, so after 10 minutes or so I decided to land. The morning of Friday the 26th was great flying as long as you were foot launched. Pierre, I and several other trike guys watched with envy as a good group of guys took off to the Monument Park. We spent he afternoon swapping hanger stories taking showers and hanging around the pool. About 4:30pm the winds started to come down and everybody left for the airstrip. The flying was great. I flew for 45 minutes or so and climbed to 1485 ft AGL. The winds were very light and I landed on almost on the same track as the one I launched from. It was really beautiful with the sun going down and wings all over the place. I went around the back side of the south butte behind Gouldings and saw a solitary glider cruising just above the surface. This was the kind of weather I had been hoping for. This was the afternoon that John F. went up on his homemade trike and had trouble with the power loops. I understand that he was firmly into a turn when one of the loops was pulled outboard…. he kept the turn until he was into the wind and landed without incident. That evening I had dinner with John F. and Jon Z. who brought along his whole family. Later I hooked up with Andy MCavin, Chris Page and the “Fly Into the Wind” crowd. Ky and Lon Dzung were the heros of the night with the lemon turkey roasts that Lon cooked for us. Lon had a hard time the whole trip with his motor…seems like he couldn’t get enough power. He messed with the carb and fussed all weekend but didn’t get it running right until a they were on the way home when a 1 dollar part was discovered to be the problem. Ky is one of the strongest pilots I’ve ever seen. He would have a very long run out only to get a foot or two into the air and then would touch down and run some more. I thought I was tenacious when I had trouble foot launching but Ky never gave up. His wife Lon is a dear. Probably 4 foot 5 inches and there was nothing she wouldn’t do to provide for the comfort of her husband and his friends. Every time I turned around she was pulling me to the cook fire to have some more to eat. I don’t think she sat down the entire weekend…either filming or cooking or making the campsite better. I am amazed and honored that such a great group of pilots agree that this place is “THE HOLY GRAIL”. Chris and his crew took a great bunch of photographs which can be seen on their Website. He is currently filming for Into the Wind 2 and I look forward to seeing the footage from this trip in the movie. 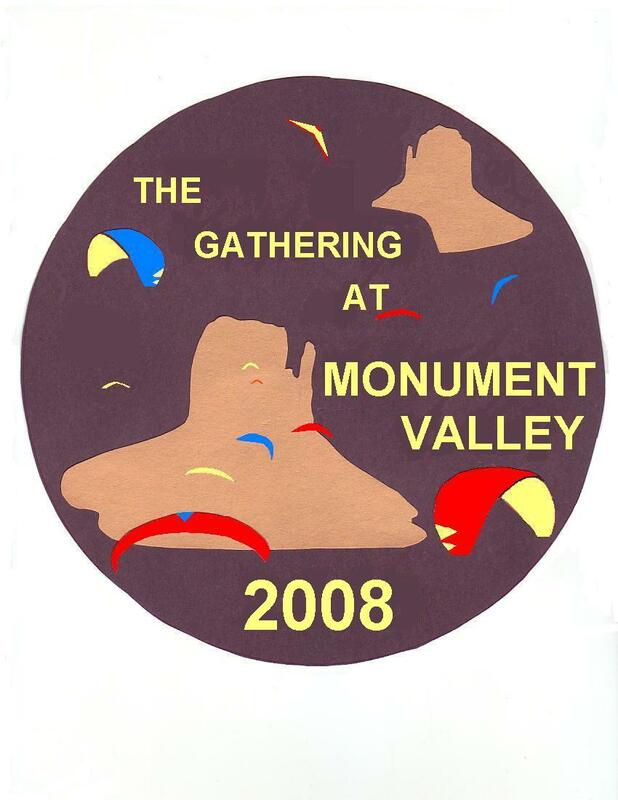 The Gathering at Monument Valley is a non-sponsored event. There is no individual or company charged with monitoring our activities….So protect yourself and our sport by using common sense. Below are the Ultra Lite procedures for Gouldings Lodge and Trading Post, please print, sign and turn it in at the campground office. Be advised the management expects a large amount of General Aviation traffic over the weekend, fortunately during the first and last hours of daylight the airstrip will be clear of commercial traffic, so we should not be adversely affected. If you desire to go thermal and fly midday, they ask you to launch and fly well clear of the airstrip. The following are procedures to be used at the Goulding’s airstrip in Monument Valley. -Overnight camping is allowed only at the campground. -Please sign foot note below agreeing that the airstrip is “fly at your own risk”. -Ground equipment(trailers, etc. )should be parked on the west side of the airstrip in the big gravel area south of the windsock. Do not park near the hangar or on the paved areas. -No overflights in the areas south and west of the runway between the runway and the cliffs(mesas?). Do not “buzz” any of the Goulding’s Lodge buildings. -Any ground equipment or aircraft that is to be left at Goulding’s airstrip after you leave must be cleared with management. -The asphalt parking area at the south end of the airstrip is reserved for commuter aircraft and short-term parking. Other aircraft should use the dirt parking area west of the runway. -Takeoff is from runway 34 and landing is on runway 16. -Field elevation is 5,208’. Be aware of density altitude. -The Monument Valley Navajo Tribal Park is a separate entity from Goulding’s Lodge. The park superintendent has asked Goulding’s to please “suggest” to Ultralight individuals that they pay the $5.00 per person entry fee into the park if they plan on flying over the park. All Goulding’s Lodge is doing is following up on the park’s wishes. Goulding’s Lodge has no connection with the operation of the park, or their policies. I have read and understand these policies. I understand that Goulding’s airstrip is private and is “use at your own risk”. 1) What is the Registration Fee? There is no fee…however the Navajo request a $5 donation for each day you fly into the park. There will be a envelope at the campground office which will be delivered to the Navajo Park Headquarters. 2) What Facilities are available? Gouldings Lodge and trading post is a self contained village with Motel, Restaurant, Grocery Store, Fast Food, Gas Station and Campground. The campground includes a swimming pool, laundry, gift shop, Internet station and showers. There are also”Porta Johns” located around the campsites. 3) I have not reserved a campsite, can I still come? YES ! Gouldings has promised plenty of overflow space for late comers. 4) Do I have to stay at Gouldings? NO…The Navajo Tribal Park has dry camping available on a first come first served basis. 5) Is Aviation gas available at the airstrip? NO ! If you require av gas….bring it with you. 6) What about the Banquet? Several people have indicated they would like to attend a group dinnder Saturday night, but not enough for the kitchen to prepare a “Banquet Meal”…NO PROBLEM…The restaurant is going to hold the private room for us and everybody can order off the menu. Sorry …no booze served or brought in. Cocktail parties prior to the Banquet are encouraged. 7) Are there going to be T-Shirts? Well sort of…A limited supply of Patches and Caps have been commissioned and orders will be taken for the “Official” Long sleeve denim shirt during the weekend. 8) Do I need to drive from the campground to the LZ? Probably, it’s 3/4 of a mile from the campground to the airstrip. If you have a trike you could probably drive it down but there is a grade and your boots are going to be smoking by the time you get there. Gouldings is going to assign an area at the airstrip where we can “park” our equipment if desired. There will be adequate parking at the airstrip. 10) What if my questions are not answered here?